Manchester had since the seventeenth century been a centre for radical movements, and many of its people in the late eighteenth and nineteenth centuries devoted themselves to the abolition of slavery. Although it was never a slaving port, Manchester was tightly linked to the African slave trade because, beginning in the seventeenth century, the “coarse check” cloth and the silk handkerchiefs its mills produced were one of the principal goods which English traders exchanged for captives on the West African coast. Moreover, as the global demand for cotton clothing boomed in the eighteenth century, traders brought ever more slave-grown cotton in to be processed in the Manchester mills. Visiting abolitionist activists found Manchester a fertile ground in which to spread their message and raise funds for their cause; important visitors included Thomas Clarkson, the founder of the British abolitionist movement, who on 8 October 1787 gave an address at Manchester Cathedral which effectively kicked off the parliamentary abolition campaign. Nearly 11,000 people (more than one fifth of the city’s total population at that time) signed Clarkson’s petition in favour of the abolition of the Atlantic slave trade. Another visitor was the former slave Olaudah Equiano, who came to Manchester in 1790 to support the abolition campaign and to promote his recently published autobiography, whose first-hand account of slavery, particularly of capture in Africa and survival of the dreaded “Middle Passage” to the Americas, had a profound impact on the abolitionist movement. While the abolitionists were overjoyed by Britain’s abolition of the Atlantic slave trade in 1807, many felt that much remained to be done. Manchester cotton goods were used as a trade good in the now illegal slave trade, which persisted for several decades after 1807. Of far greater concern was the fact that it was slave-grown cotton from the American South which was the principal raw material for Manchester’s textile mills. One might expect that, once Britain abolished slavery in its colonies in 1834, the British anti-slavery movement would end, but it became more fervent than ever, not only because Britain traded extensively with the American south, but because American activists looked across the Atlantic for a moral example. Both white and black abolitionists made repeated visits to Britain to meet with British campaigners and raise awareness of and funds for their cause. Many black anti-slavery campaigners were ex-slaves who lived in terror of the American fugitive slave laws, so some of them chose not only to visit but to settle in England. Many of these people came to Manchester, the most famous of whom was probably Frederick Douglass, who was born in Maryland in 1817. He lived with his grandmother on a plantation until the age of eight, when he was sent to work for his owner’s brother in Baltimore. The man’s wife defied state law by teaching him to read, and the adolescent Frederick gained both artisanal skills and knowledge of the wider world, and thus of the possibilities for escape, working in the racially-mixed shipyards of the great port of Baltimore. In 1833, after seven relatively happy years in Baltimore, Frederick was returned to the rural Maryland plantation on which he was born. After years of comparative liberty, he found it extremely difficult to re-accustom himself to life on the plantation, and resolved to escape. In 1838, posing as a free black sailor, he escaped by train to New York City, where he changed his name to Frederick Douglass. He wrote of his escape: “I have often been asked, how I felt when first I found myself on free soil…A new world had opened upon me. I lived more in one day than in a year of my slave life.” He later moved to New Bedford, Massachusetts, where he worked as a labourer, and began active involvement in the anti-slavery movement. After hearing Douglass speak in 1841, William Lloyd Garrison, editor of the fiery anti-slavery newspaper The Liberator, arranged for him to become a lecturer for the American Anti-Slavery Society. Douglass was a great success, and in 1845 the society supported the publication of his autobiography, The Narrative of the Life of Frederick Douglass, a classic narrative of slavery and African-American autobiography. After the book gained considerable popularity for its dramatic story of suffering and escape its graceful and forceful prose style,, Douglass was afraid that his new-found fame might result in his recapture by his owner, and so embarked on a lengthy trip to Britain. Struck by the passionate agitation against the Corn Law which he observed on visits to Birmingham and Manchester, he became active in the anti-Corn Law movement, and was intrigued to learn about the economic theories of the “Manchester School” (a group of liberal intellectuals committed to free trade and opposed to mercantilism, led by Richard Cobden and John Bright), which defined his views on many social and economic issues for the rest of his life. He was extremely impressed by the degree of political engagement he observed amongst the English working classes, and particularly, in Manchester, by the fact that, although many workers’ livelihoods depended entirely on the continued availability of slave-grown cotton, they nonetheless empathised with the sufferings of slaves. Douglass visited Manchester in 1846, speaking at the Free Trade Hall at a meeting of the Anti-Slavery League, and stayed for several months in St Ann’s Square. Notoriously, Douglass was said to have been spotted exiting a Manchester brothel. Douglass was furious at this charge, and sued for libel the Free Church of Scotland minister he suspected was behind the rumour. 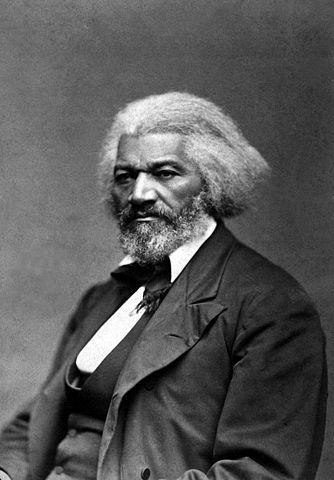 Douglass had angered the Church with his “Send Back the Money” campaign, which urged it to reject the donations of Scots-descended slaveholders in the United States. He eventually extracted an apology from Reverend Smyth, but the tactic of playing upon Douglass’s sexuality would be a constant weapon in the arsenal of his antagonists. This entry was posted in Interventions and tagged Ethnicity, history, Manchester, Politics on October 24, 2011 by citiesmcr.